Lexington Vintage Dance, with headquarters in Lexington, KY, is dedicated to researching, teaching, performing, and promoting the ballroom and social dance forms of the 19th and early 20th centuries. Experience these beautiful and dynamic couple dances for yourself through the activities of LVD. 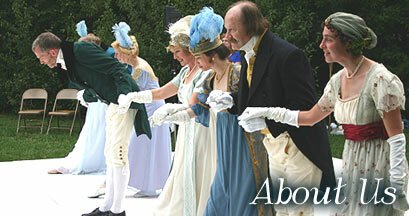 We encourage you to see a performance by the Lexington Vintage Dancers, take a class, or come to a ball. LVD is a non-profit educational organization and a member of LexArts (the Lexington Arts and Cultural Council, www.lexarts.org). Contributions are tax-deductible. "Your group is keeping alive a piece of our unique American history which affected nearly everyone." The Lexington Vintage Dancers are always looking for new members. If you think you might like to join, please attend one of our dance classes and let the teacher know that you are interested in joining the troupe. The teacher can assess if you are ready for the level of dancing expected of troupe members or advise you to take more dance classes first. Potential members are also invited to attend a few troupe rehearsals as observers in order to meet the troupe members and see if they can work well in the rehearsal environment. New troupe members must be approved by the troupe membership committee. We look for people with some dance background (not necessarily in vintage dance) and a friendly disposition who are willing to be team players. Learning our choreographies and dance styles and acquiring period attire takes time, so potential troupe members should be committed to staying in the Lexington area for several years. You need not join with a partner, but since we must maintain approximate gender balance in the troupe, we cannot always accept a single woman (or single man). Troupe members pay no fees and receive no compensation (other than travel reimbursements and free admission to some events). The look of authentic period dress is an important part of our presentations. Dancers own their costumes, which are usually reproductions of period attire and must meet strict troupe standards. Dancers pay for their own costumes---a ball gown can cost hundreds of dollars---but grants are often available to help troupe members with part of the expense. Troupe members are enthusiastic about vintage dance, are eager to improve their dance skills, and have a desire to perform. Other avenues are open to those who are interested mainly in social dance and recreation.